Great White experienced a huge change in 2011. 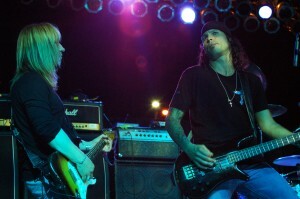 Terry Ilous was named the permanent singer to replace Jack Russell as he had been filling in for him during the live shows. 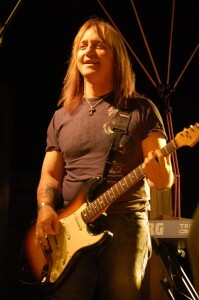 The band still consists of founding member guitarist Mark Kendall, drummer Audie Desbrow, bassist Scott Snyder and guitarist/keyboardist/producer/engineer Michael Lardie. Michael was able to take some time out of his busy schedule and talk about their latest release and first with Ilous at the microphone entitled Elation. Rock Show Critique: Hi Michael, Elation makes it an even dozen studio albums, did the recording process differ from the past few releases? Michael Lardie: Probably, mostly if anything the speed with which we did the record. We recorded and mixed it in thirty five days which is quite quick. Usually thats in the high forties to mid fifties. One of the other things that differed from what we’ve done before was we had enough material going in. As we were working on the record we found that the stuff we were coming up with in the studio on the day before we actually started to record the material was eclipsing quality wise of what we had going in. So it was very fast and furious writing it, recording it on the fly like that we had never done that before. It was really exciting to do it like that. RSC: What songs do you feel are the best tracks on Elation in your opinion? ML: You know its really interesting I sent out a text to all the guys when we were planning to do the video. I said answer quickly which two songs would you pick a video to and everybody came back with two different songs. Hopefully that speaks that there’s some depth within the album. I think there a lot of hooks on the record that are typical Great White. You have the real dirty blues on a song called “Lowdown”. You got the classic Great White eighties thing that’s more like “Heart Of A Man” or “Just For Tonight” those are kind of in the realm of the “Lady Red Light” kind of thing you got a ballad with “Hard To Say Goodbye” that’s very stripped down and personal. “Complicated” is very reminiscent of “OBTS” or some people even say it sounds like the Faces. I said well I can take that compliment. It’s hard to say what one or two songs would be definitive and what would be my favorite. The fans on itunes if I had to go by that they’ve spoken and said “Shotgun Willie” and “Complicated” are their two favorites. RSC: Where does Elation rank among the rest of the records in your catalog? ML: It’s interesting to me its an amalgam of two records that were in our catalog. Journalists have asked me where does it fit in the hierarchy of your material and I would see it probably slotted nice between Hooked which had a very blusy feel and Psycho City which was quite a bit harder edged. I think Elation has a good combination of both. RSC: At any point did you guys ever consider changing the name of the band? ML: It really hadn’t crossed our paths. We had gone out in the latter half of 2010 and all of 2011 under the name of Great White. During that time we probably did eighty to eighty-five shows and people were coming to the shows. I know obviously Mark was one of the very original people and Audie and I have been in the fold since ’85. So it just felt like it was Great White. RSC: What album as a whole are you most proud of? ML: This one for obvious reasons cause it was such a family driven thing. Everybody was present at every hour of recording which was unusual for all band members to be present for all that time. For that I’m proud of this one. One of my favorites historically would probably be Psycho City. RSC: What did you do on Psycho City? ML: I was co-producer with Alan Niven our former manager and engineered it, wrote and played on it. It was a lot of fun. We actually rented a residence and pulled up a mobile truck and recorded the album inside an actual functioning home. RSC: At one point the band stated that they would never play “Desert Moon” live ever again. Obviously that was before you rejoined the band. How did it end up making a comeback? ML: You now my feeling when I came back in 2007 after my stint with Night Ranger was getting the guys to see that it wasn’t really the song that was responsible for the horrible tragedy that had happened. For me personally it was a song that I always loved because I had a lot to do with the composition of that tune. I always believed if we played it and stood proudly about it and explained to people that it wasn’t the song it was the circumstance and to disassociate the tragedy with the song. 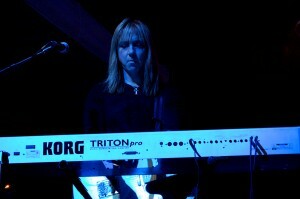 Was interesting at M3 last year (2011) we played and we knew that ten of the survivors were at the show. I was really wrestling with the concept because we had been opening with it for a while, I just had a feeling in my gut that it was the right thing to do as it was we played the song and all the survivors came back after our show and gave me a hug and said I cried during the entire length of the song but then I felt free I felt like something had been cleansed for that I am forever grateful that for those people that had been involved and what had happened felt like there was something they could let go of and move on some. RSC: Here is a question that could have been asked over the last ten years. 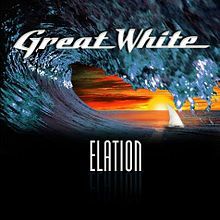 One thing with Great White is the huge catalog of songs. Why does the band seem to focus more on the same old songs like “Can’t Shake It” for example. Why not play more of the real gems like “Shot In The Dark”, “All Over Now” and “Move It” some of the other lessor songs that haven’t seen set list times in years? ML: Its interesting that you mention “All Over Now” both Audie and myself were shouting about that this last year when we were finishing off last year. That is definitely gonna make its way into the set this year. And our hope is with the new material on Elation, obviously since Terry is immersed in singing the songs and has ownership in terms of feeling like he is apart of the band and something new. Our hope is to try and get at least half to two-thirds of the record played at some point during the year. i.e. work up a couple of tunes at a time play them for four or five weeks and then shift them out then try a couple more. I know everybody’s been looking to try to throw in some of the catalog. There is stuff we’ve never played that I would love to play. One ballad that I thought was pretty great was “She Only” and it only got played that one time. So hopefully we gonna get some older gems in there this year. RSC: When you came back in 2007 how did you come about choosing the song lists for the shows. Was it a democratic process? ML: Its always been the focus to be a democratic process as far as what songs we chose to work on. We wanted to get a couple of songs from the new record Back To The Rhythm because that was our latest record at the time and work through some of the tunes that we haven’t done. I know our reformation gig at the Key Club in Hollywood that was about two hours and twenty minutes. Quite a few songs after doing show after show after show was nineteen or twenty songs cause its a little harder on the body. 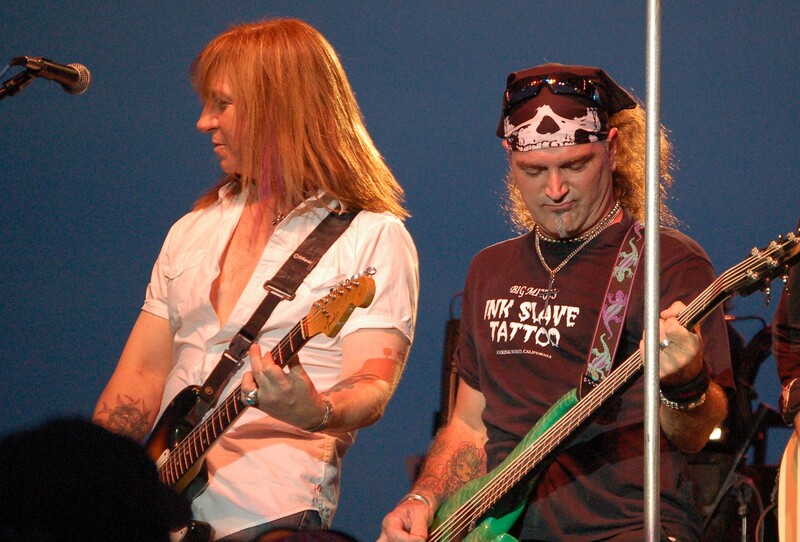 RSC: Tell us about your experience being in Night Ranger. How did you first meet Jack Blades. RSC: How did Jack Blades get involved with your producing your Can’t Get There From Here album? ML: Actually we got signed by John Kalodner of Portrait which was one of the Sony/Geffen gurus. One of the contentions that John had was to give Blades the opportunity to produce us. We always done it this way, I thought it would be good to get some different input now and again. I think its a great record, a lot of fun. I engineered the record so obviously my stamp is on there it was great working with Jack. To this day I worked on projects with him and Tommy Shaw its just been a relationship that’s now almost twenty five years. RSC: So when you are not recording, writing, producing, engineering or touring what do you do for fun? ML: Well, I’ve actually been doing a lot of fun stuff since I’ve been out here in Detroit. Last weekend we went down to a place that has outside kareoke believe it or not right in the middle of downtown Detroit. You wanna talk about a melting pot it was so much fun. Some of these street people are singing these motown songs that would put American Idol contestants to shame. So the bar was so high. It was really a enjoyable afternoon to soak up the culture such a mixture of things you feel comfortable you feel safe. I know a lot of people have it out or a bad rap for Detroit. But I’m telling you its a great town. People really care about each other out here. But there again if music is your life its hard to escape music even in your downtime. Special Thanks to Melissa Kucirek for setting up the interview and Michael Lardie for his time.